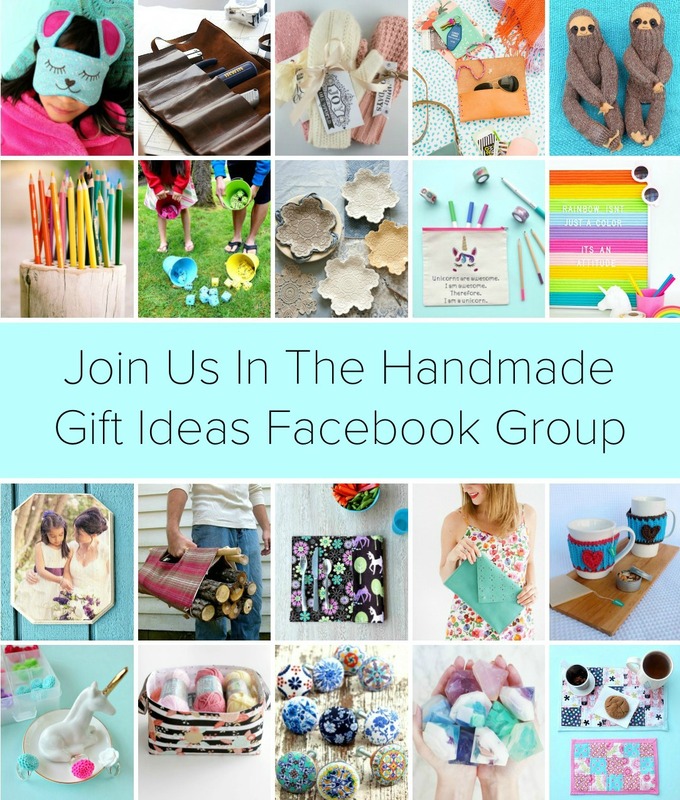 Read to the end of this post for your chance to win a $50 Rose and Rex Gift Certificate! Today, let’s talk about play. 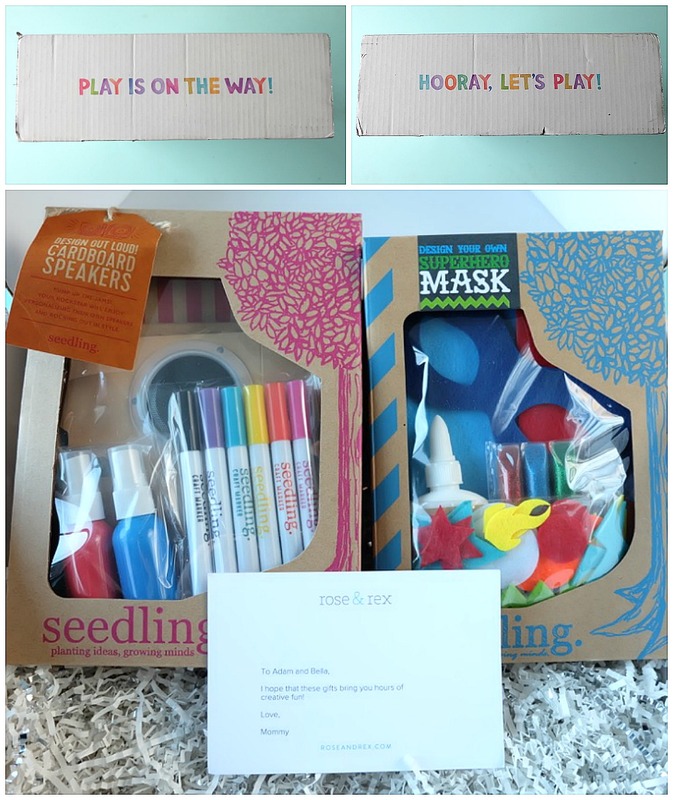 More specifically, creative play. I think most parents would agree that they love supporting creative play and exploration in their children. We know that creativity plays a strong role in a child’s mental and emotional development. What creative play looks like is different for every family and every child. I consider myself a creative person, however I’ll admit that using my imagination while playing, something that used to come so naturally to me as a child, is much more challenging now that I am an adult. Would you agree? 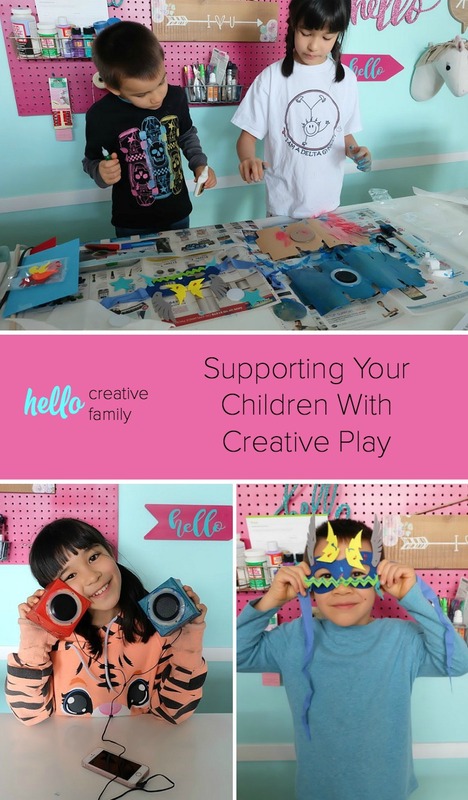 I was recently having a discussion with a friend where I confessed that while I encourage my children to express themselves creatively and engage in imaginative play, I have a really hard time crafting with my kids (especially my younger child). I told her that I felt a need to “take over” when doing craft projects with my kids because I feel a strong need to make everything look “Pinterest worthy”. I have a much easier time if I’m working on my own project, while my kids are doing their own creative activity. When I think back to my own childhood, I wonder if my own parents felt the same way. I was raised by two creative parents and I consistently saw them pursuing their creative passions, but we’d rarely work on a project together. Instead they would provide us with the tools we needed to be creative and we’d work alongside each other on our own projects. I know that I’m not alone in this problem of having a hard time not taking over. For the past couple of years I’ve been teaching cooking classes in my local community. One of my favorite classes that I teach is a parent and tot class with kids ages 2-5. I love making pizza with the kids because not only does it taste delicious, but it’s also a wonderful medium for kids to express themselves creatively. At the beginning of the class I always explain that pizza comes in all shapes and sizes and that there is no right or wrong way to make a pizza. I explain that making a pizza in a circle can be rather challenging and that I encourage the kids to play with the dough instead of fighting it and to create their pizza in whatever shape the dough takes. Guess what happens? The majority of the pizzas end up being circles because the parents end up taking over the pizza making duties. 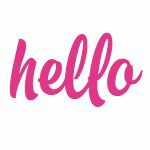 It can be hard to let go of the reins, but that’s exactly what I did recently thanks to an experience I had with Rose and Rex, an online play resource, which sells elegantly designed toys that promote imaginative play. 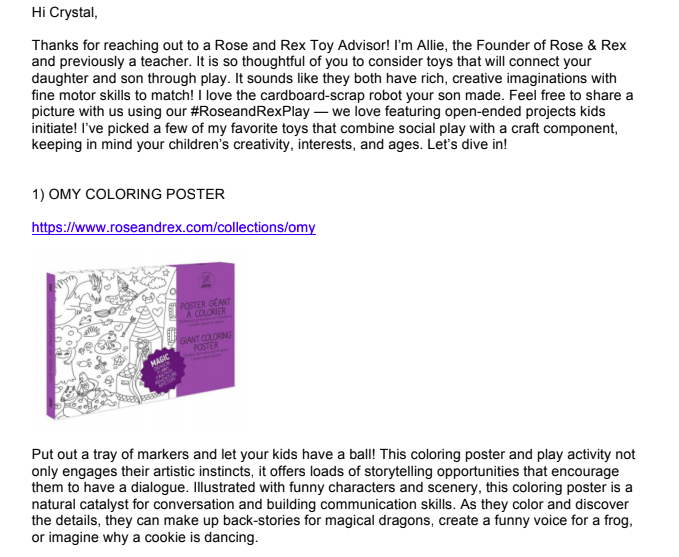 Rose and Rex is more than just an online toy store. The owner, Allison Klein is passionate about the importance of imaginative play on childhood development. She is a “play-based tutor”. 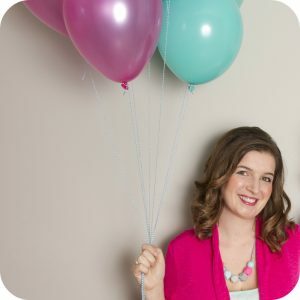 I recently watched her on Instagram stories teach a class to parents and their tiny tots on how to encourage creative play in your children. She’s so passionate about giving kids the tools they need for creative play that she’s developed the Toy Advisor program at Rose and Rex. 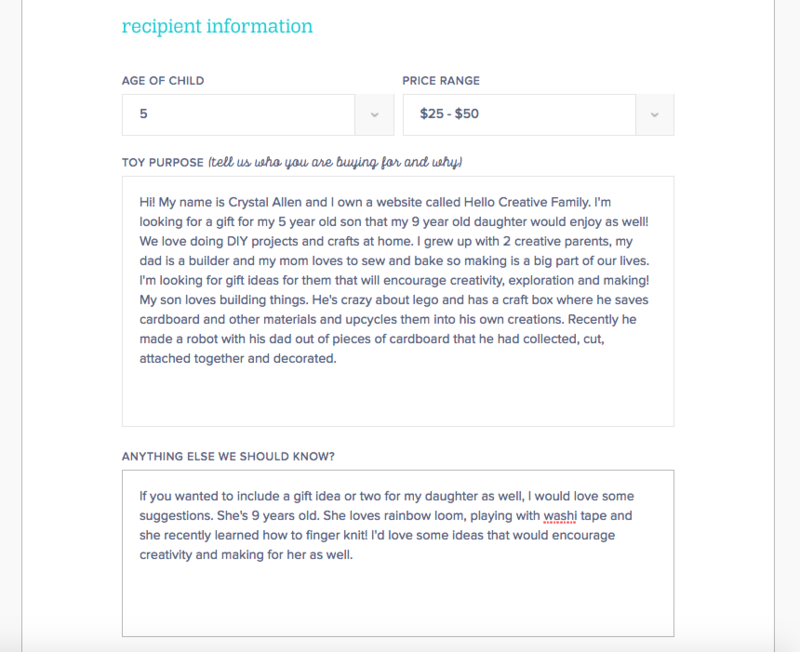 Fill in a form on the site sharing information about the child who you are shopping for, including their age and the toy’s purpose. A toy expert from Rose and Rex will go over your information and create a custom list of toys that they would recommend for the child. Allison sent me 5 toy suggestions for my son, 2 toy suggestions for my daughter along with a toy idea that they would enjoy using together. Thinking about my goal of starting to let my kids craft without taking over I selected two craft kits from Seedling from her list. 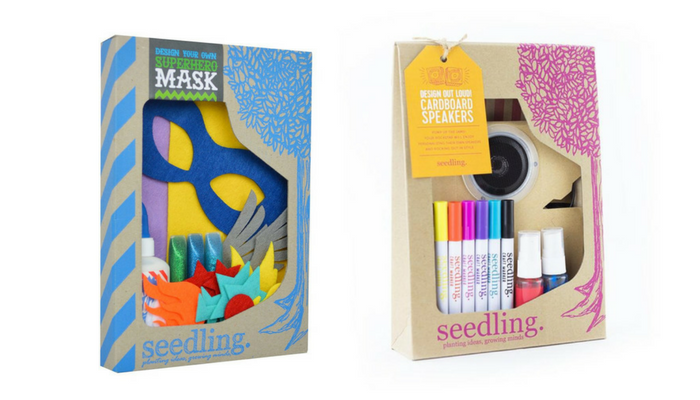 The Design Your Own Super Hero Mask and Design Out Loud Cardboard Speakers. I had decided to have the box addressed to the kids and I had them include a free note in the package. I pretended that I didn’t know who the package was from and when the kids opened it they got a special surprise from mommy! I set the kids up at my craft room table with a bunch of newspaper laid down and let them go to town creating! I snapped a few pictures and then walked away to let them create without me peeking over their shoulder. I decided not to worry about the mess, or what the end project looked like, and instead to let them really enjoy the process. Their craft projects may not have ended up exactly the way I would have done them, but they love them and have so much pride in their finished work. 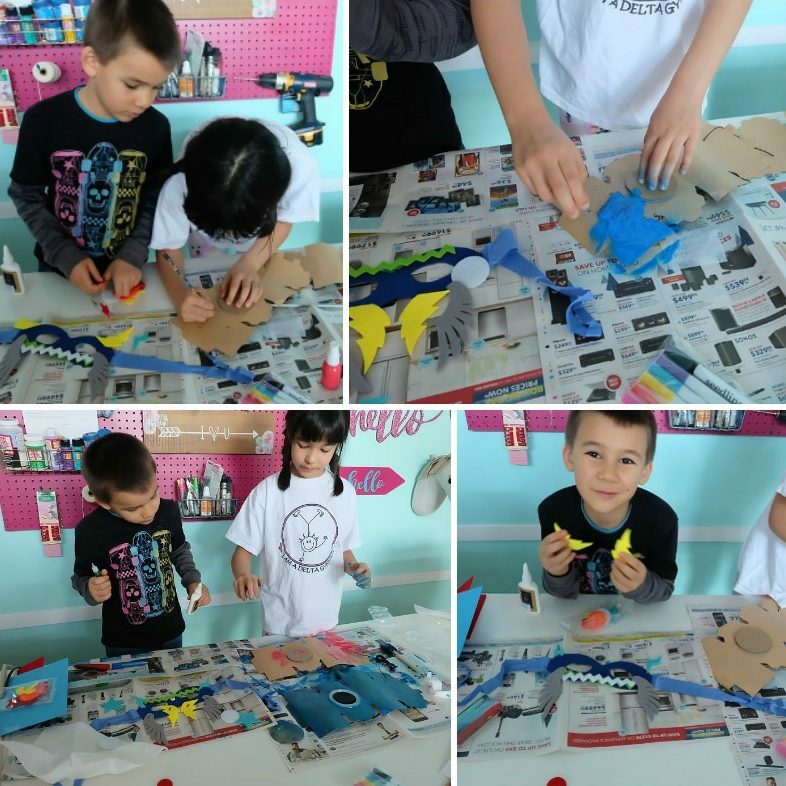 They had a wonderful time creating from their own imaginations without any input from mom! 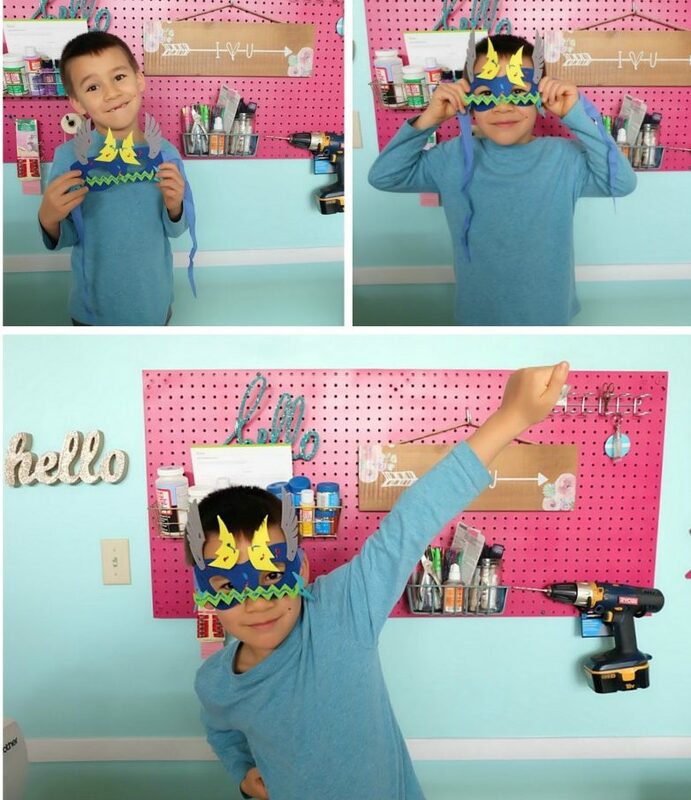 This super hero loving boy is over the moon about his super hero mask that he crafted all by himself. 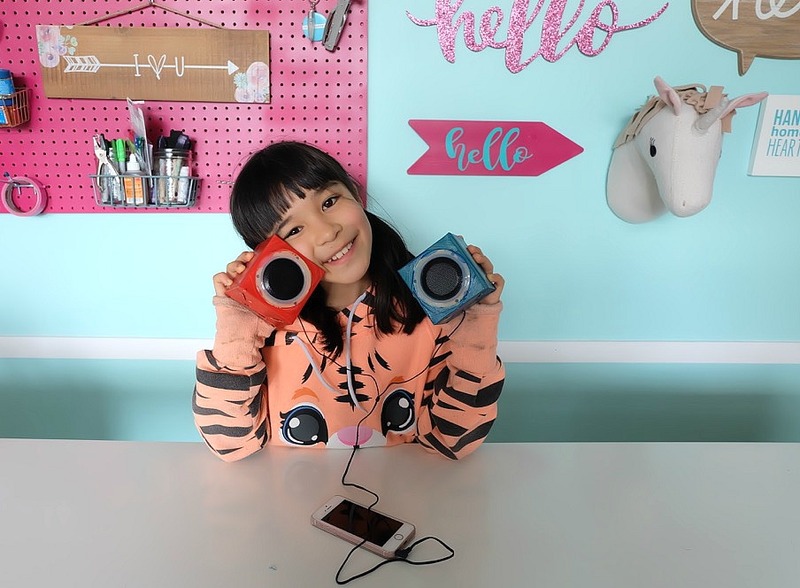 And this music loving tween is too excited to have her very own set of speakers for her bedroom that she spray painted all by herself. And this mom, well, this mom is pretty proud of herself that she loosened the crafting reins and let her kids do their own thing creatively. I think that as parents, the best thing that we can do to encourage our kids to be imaginative is to provide with them tools they need to be creative– no batteries, no screens, no talking heads– and then step back and watch the magic happen! 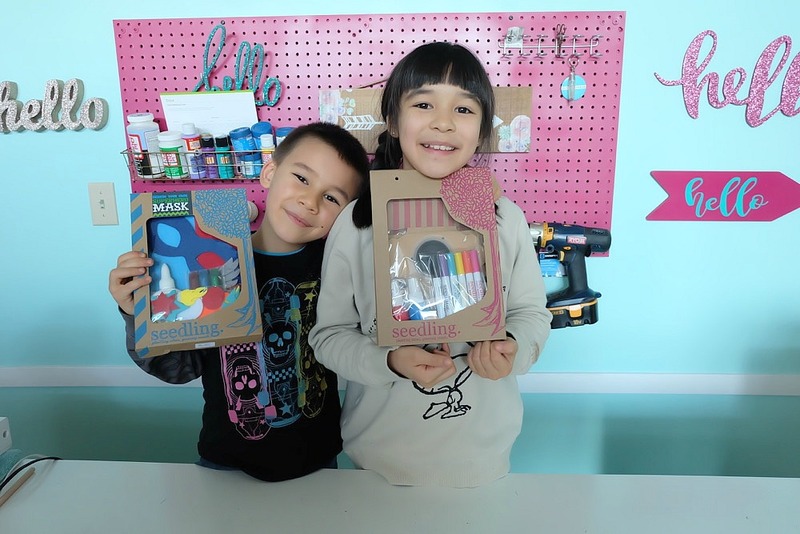 Want to win a $50 gift certificate to Rose and Rex to buy toys to encourage imaginative play in your kids? Enter below! Visit Rose and Rex and tell me what toy you’d most like to buy for a child in your life? Disclosure: Thank you to Rose and Rex for working with us on this post. 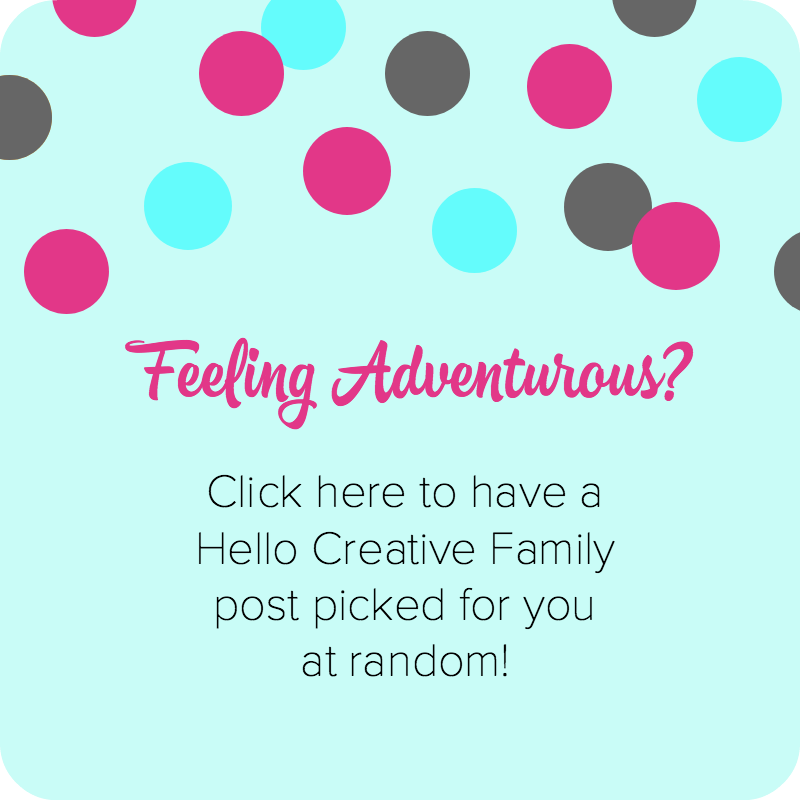 As with every article on Hello Creative Family, all thoughts and opinions are 100% our own. Such awesome stuff! I’d love to get Tegu blocks and Sight word blocks! If I won, I would buy the “My Magical Unicorn Kit” for my daughter. 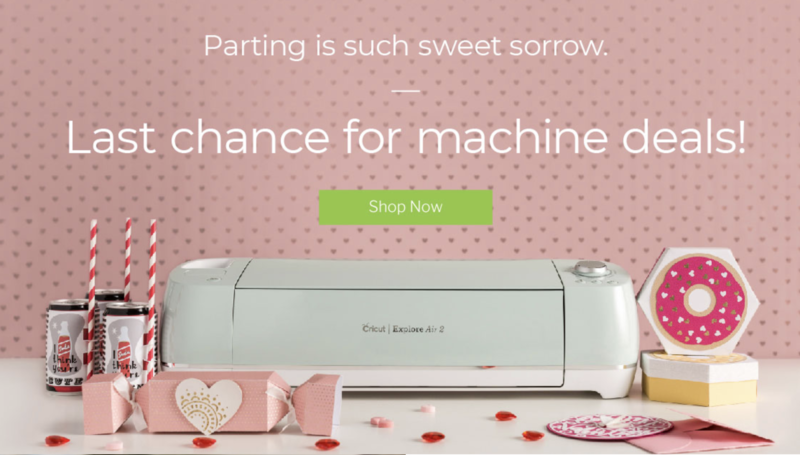 Her birthday is next week and she would love this! I think the sight word blocks or the tea party in a suitcase would be enjoyed by my kids. Thanks! I would buy the Seedling Sushi Set if I win. I would buy the rainbow building tower for my daughter! I think DD would love the Moulin Roty Real Sewing Kit. I would buy the tool kit. It is impossible to pick just one! The large silver fox would be first choice though – i jjust love the expression on his face! I would order Hazel Village Lucas Rabbit in Stormy Romper. Cute. Perfect for my 1 month old niece. If I won, I would buy the Dancing Cat and Mouse in Shoebox. I would get the community helpers peg doll set. I would get the Make your own dreamcatcher kit for my daughter! I love the Sleepy-Wakey Reindeer. I’d get a hazel village doll or play dolls and a mouse in a box! I would buy the Magnolia Paper Doll! I would buy the Rainbow Building Tower. I love how colorful it is. I would buy coloring balloons. That looks like fun! 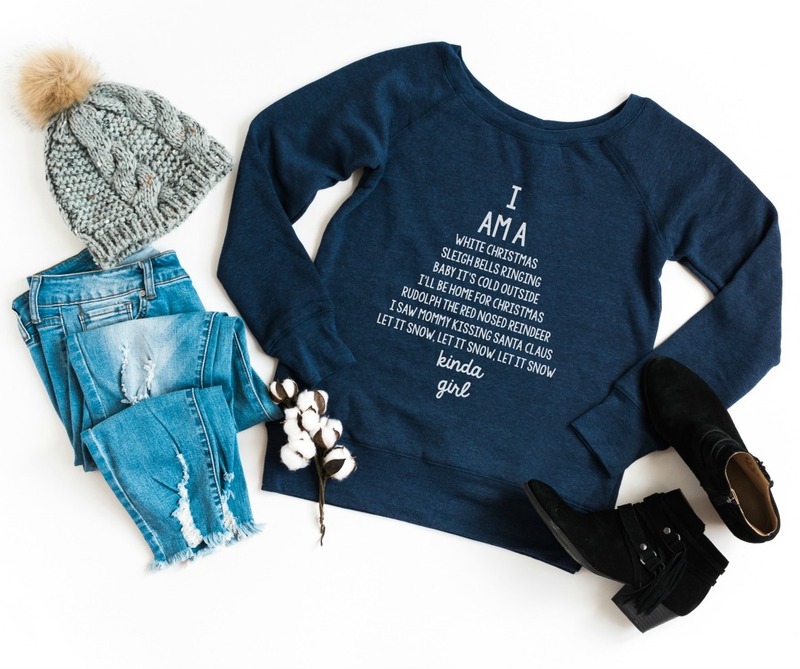 I would get something for my best friend’s daughter. I’m not sure what I’d get her yet but the tea set is super cute! the tea set is cute! I would buy the Legend Candy Lab Race Car and the Omy Paris Foil Art Magnets if I won the Rose And Rex Gift Card. If I won I would get the Treasure Hunters Kit. Umm I want everything. Seriously so many cute things to choose from. I love the nursery rhyme blocks. The sight word blocks is what I’d get. I love the city themed soft blocks! I would get Frida the Robot Puzzle. These are so cute !! I love the Dancing Cat and Mouse in Shoebox. It is so lovely. The rainbow beans set or I would put it towards the adorable mice circus. I would love the Moulin Roty Real Sewing Kit. I see it’s sold out right now, but maybe it’ll come back in stock. I would probably buy the macaroon pom pom maker. So cute! So hard to choose because there are so many cute items. I guess I’d have to go with the mini fairy garden it could work well for any kid in my family. Blockitecture Garden City…I like the unique opportunity with this set! I would get the mini baby buggy! Ohhh I would buy the pom pom makers or the periodic table blocks! If I won I would get the WOODIE SURF CAR for sure.. If I won I would buy the Magnolia Paper Doll set and the New York Coloring Poster. Thanks for the giveaway! The Princess Mouse and the Pea Set! My daughter would have a lot of fun with the Donut Pom Pom Maker!